Staging a house to sell can be managed easily on a small budget. Indeed, staging your home is more about taking things away than adding items. Too much stuff and extra furniture detract from the 'bones' of the house. Nobody needs to spend big dollars to bring about a quick and easy sale. Learn how to make a budget to stage your home. You will be amazed at how easy it can be to sell your home. Statistics show that staging your home will make a big difference in the amount of time you wait for a sale. Based upon a survey conducted by The International Association of Home Staging Professionals®, staged homes spend 83% less time on the market than non-staged homes. 94.6% of ASP staged homes sell in an average of 33 days or less. 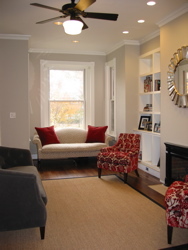 Hire a Stager or Color Consultant today. That's right! Get out! Obviously, the home seller wants to move out as soon as possible and there is a trick to achieving that goal. Stage your house to 'sell' your home. Remove the confusing clutter and extra personalized pieces. Sometimes it might even be necessary to rent a storage unit. But don't live in it! It's for your "things". This minimal cost can bring maximum results. If potential home buyers are not overwhelmed by tons of stuff, they can more easily see themselves living in a home. Your home has to outshine other homes on the market. The house must have the ultimate appeal. A spotless home makes a big impression on buyers. Sparkle, sparkle, sparkle! Cleaning a house from top to bottom takes a bit of effort but it does not have to eat into your budget. Vinegar, baking soda, and lemon juice will not break the budget. Yet they will leave your home fresh and clean – the natural way. Paint color ideas can hasten or impede a home sale. Home buyers base their decisions on what they see in the moment. They will not be able to see beyond hideous colors. When staging a house to sell, earth-toned colors (shades that reflect nature) such as tan, green, blue, grey, and golden tones are the best choice. A leading real estate agent suggests that "color is huge" when it comes to staging a home and you want a "nice, neutral, warm color." Lightening and brightening a home can start at just $200-$300 but can increase the value of the home by $1000-$1500. Painting interior walls can give you a 250% return on investment. It pays to stage your home. Staging does not have to break your budget and the effort and commitment is a worthwhile investment.